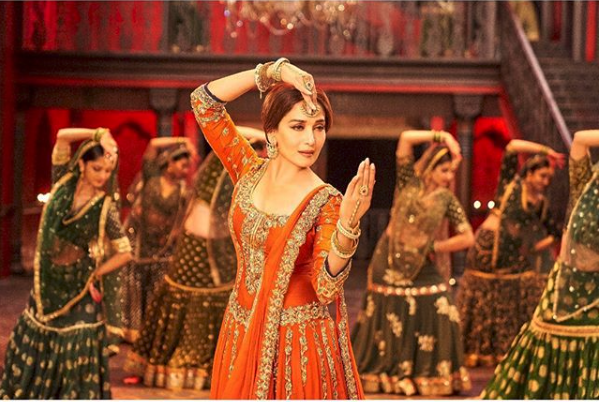 Actress Madhuri Dixit Steal's Hearts & Mesmerises Everyone With Her Performance In Kalank's Latest Song!! All those people who are waiting with excitement for Kalank to hit the theatre soon were definitely in for treat when the makers related the latest track "Tabah ho Gaye" from the movie. Not only the song was amazing, the highlight was Madhuri Dixit's applaud worthy performance in it. Producer Karan Johar released a small teaser from the song with his heart felt not for actress just a day before the reals of the song. He was extremely thankful towards the actress for making the movie and the entire experience special for him. Meanwhile his student, Alia Bhatt took it to her social media to tell her fans how it is her favourite song and is a part of her playlist. Not only did the song garner positive and response from all the fans but it also become one of the most trending song after just few days of its launch. Choreographed by Remo D'Souza and Saroj Khan as their first ever collaboration, the song and Madhuri managed to make the entire swoon and just fall in love with. The opulence of set, the royal costumes and magnificent ambience made it extremely hard to take our eyes off even for a second and it showed how well planned the details were. The song was compared to the actress's "Sara Rang" from her film Devdas but the actress denied so. Actress Madhuri Dixit is a store house expression and emotions that we all were able to see on our screens while listening to the song. The lyrics and Madhuri's amazing dancing skills were enough to melt our heart, her elegance and grace are unbeatable. The song came with a bang and managed to become a hit with all the amazing reviews from both media and audience. Only seven days are left for the movie to be released and now we are just not able to curb our excitement.